Soon the casinos will have those "flashy thingies" from "Men in Black" to use on the players after each hand. They only want folks in there who need to take off their shoes to add to 21 (doing so in your head is cheating). Those people with 6 toes on one foot have a definite advantage, and perhaps will be banned. 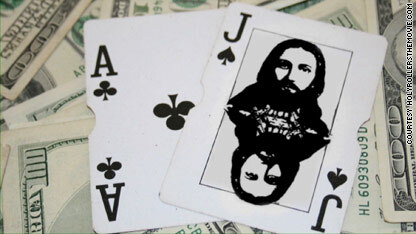 Jesus "The casino is a house of profit. But you have made it into a den of counters"
Truth is – most people that try counting still lose. Casinos know you are counting – its obvious when you keep changing your bet. They allow it until they determine that you are good enough to be a threat. if this guy is using the money for a good use then i am sure Jesus will welcome him. but if he is living a rich life and on the other side he is preaching or going regulary to church Jesus would not welcome him. when Jesus was in Jerusalem he did not welcome the jews because they did not have the truth in them. The most comforting part of being an atheist is that you're incapable of ever being wrong. The most comforting part of being a believer is that you can pick and choose what you want from the Bible and hypocritically ignor the rest. I don't agree. The most comforting part is simply being right. Observer, Go twit your liberal twit elsewhere. Then again, you fit perfectly with this Liberal crap. They all like to twit their twits. Now THAT'S what ultimately matters. No CO2 emitted here. Or not much more. It's OK, GoreBull won't mind. He's probably out twitting his twit with some other woman (or man). 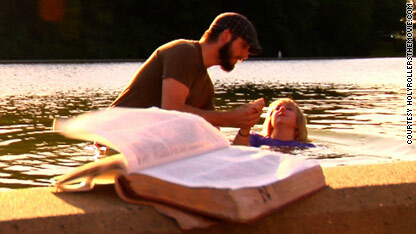 Christians do pick and choose what they want from the Bible. That's why they trash the "abomination" (like eating lobster) of being gay while IGNORING the MUCH greater number of their own who commit the Ten Commandment SIN of adultery by divorcing and remarrying. If that's the case why haven't things gone how you would perfectly want them? It's not wrong to you because you've accepted to be wrong. Nope. The nice thing about being an atheist, is that science is always evolving. We know we don't have the "whole truth", and our house of cards doesn't all fall down, when another piece of science is discovered, unlike beliebers, where the whole thing crashes when new things are discovered. Christianity really should be named for The Five Voodoo Doctors aka P, M, M, L and J ( "The Pauletaling") with their changing of wine into blood and bread into living tissue and the raising of at least two dead people. Is card counting voodoo? Of course not but believing that Jesus would really care about it one way or another definitely is voodoo!! "And they will know we are Christians by our Love...."
Except, of course, if you are gay or pro-choice. With religion ANYTHING can be justified. Makes you feel better for a worthless life. Yep. Jesus said the same thing. Good thing He hated religion as well. This story is typical Liberal Lies and Deception. It's simply amazing the Liberal Crap that this website spits out. Total Garbage. Like Whitney Houston and Michael Jackson and Pelosi and Reid and Hossien. Larry, if you get back in your trailer and behave I'll let you play with your Bristol Palin the Dancing Cow Doll. Did you mean Whitney Houston who the REPUBLICAN governor of New Jersey gave the SAME honor as our war dead? Observer, Thank GOD for the REPUBLICAN governor. Yes, GOD. Something you Atheists do not believe in. Your Liberal governor would be out twitting his twit with some other woman (or man, or both). Why do you call it liberal? Is it because you disagree? If it is the truth, why does t have to be conservative or liberal? I would think as a Christian you would want to know what is going on in the name of our savior!! It seems anytime the conservatives don't like something they say it is liberal. The truth matters, at least to me. First of all you ignorantly assumed I'm an atheist. I'm not. I'm agnostic. Secondly, you apparently believe that Whitney Houston deserves the same honors as the brave soldiers who have died for our nation. So much for your priorities. Observer, You have the arrogance to compare Jesus and Santa Claus. That says it all. But then again, you fit right in with this liberal crap. Go twit your twitty. ????? No dinner for you tonight Larry. Is reading a problem for you? I NEVER mentioned Santa Claus. Is he very important to you? Who cares what a mythical being thinks? Do you care what Santa Clause would think? Just like Santa, Jesus is based on an acutal person who lived .. also just like Santa, Jesus had no majical powers and is just an exaggerated story for the entertainment of children (and child-like adults). Now God, there's a mythical being! Just like Santa, Jesus is based on an acutal person who lived .. also just like Santa, Jesus had no magical powers and is just an exaggerated story for the entertainment of children (and child-like adults). Now God, there's a mythical being! Hey Tessy, looks like you need some free contraception. The Libs are looking for people to testify....apply soon before it's too late. So I gotta know, did someone in the church hurt you when you were young? If so I'm sorry. I just find it interesting that you would choose to spend your time clicking on, reading and responding to articles of a religious nature. Maybe this means you're at least wanting to have a healthy, respectful discussion about faith? I would assume from your comment that that's probably not the case, but I wanted to give you the benefit of the doubt. interestingly enough, the real St. Nick slapped Arius for claiming some of the very things you are advocating. Larry, quick look up .... the point just went over your head! I don't see a problem with it. One is just using statistics which is perfectly fair. Card counting does not require you to be gambling .. so is card counting still bad? Casinos don't care if you count cards while NOT gambling. What was your point? Church leaders are called to be "above reproach" (1 Tim.3:2). "Living in the gray" (as the video says) is almost directly contrary. Observer .. the story is about wwjd about card counting not casinos. My comment was in that regards, you must have lost the point of the story itself. My point was to question what is actually wrong with the scenario .. cheating or gambling. It is still gambling. You just increase your chances from something like 48% to something like 51%. You lose a lot and win more. You still have winning streaks and losing streaks. You can still bust out. That said, I dont remember anything in the bible against gambling. Specious logic, Observer. Casinos are a business that makes money because they are NOT gambling, to begin with. They are playing the percentages, which are purposely stacked heavily to their favor. Theirs is as precise an enterprise as sending a rocket to the Moon. But in order to do that, people have to play by the house's percentages. Casinos call that "gambling." You could just as easily call it "losing." It's a big business. But there's a flaw in blackjack - the decks. They can be predicted, over time. It's not the players' fault that this is so: it's the casinos' fault. Would you fault a poker player for playing better than the next guy because he knows more and has a better head? If CNN and this reporter believe in God you're shameless blasphemer and should read your Bible, if not your idiots for thinking atheists would even click on this link. How about a merger of CNN and MSNBC so you're choice of stories, poor spelling / grammar and most of all anything remotely close to true journalism. I don't watch or listen to Fox News either and finally gave up reading newspapers. Walter Cronkite would not only roll in his grave he would actually wish that he could come back in kick all of you pathetic journalism hacks in the teeth. I know this will not be posted but I beg the person that reads this, "Get out while you can, go into a more honorable profession like an ambulance chasing lawyer. WWWalterCronkiteDo .. apparently he would ".. kick all of you pathetic journalism hacks in the teeth." Sounds like a Christian using someone else's name to say what they want to do .. if they weren't so good and christian. You were free to select any of the OVER 100 other stories on the main CNN news page. Don't trash CNN because YOU wanted to read their story. "you're a", I acknowledge my grammatical mistakes as well as any other ones noticed by posters. How about an atheist who is brave enough to click on this disgusting link and call CNN on their pandering to religion with the full support and encouragement by those that actually despise it. It's hard to believe that someone who has the audacity to use Mr. Cronkite's name in some pathetic show of journalistic integrity, is completely oblivious to the fact that journalism died a long time ago. You are obviously the apologist for the state of journalism today and I applaud your complete and total devotion to the role. Ad hominem attacks are so beautiful in their insight into the soul of the person offering them. I just realized, unless you like me were brave enough to click on this link to restore the true secular news and separation of Church and State, you are a very confused Christian. What a bunch of crap. So the secular press can't report on church crap ? Grow a brain. I just had an idea for a book! I'll call it "Nine Months BC" or "Joseph Will Believe Anything!" Heh heh, Mary gets knocked up and tells Joseph "God did it." He's like, "Ok, whatever." The most gullible guy in history. Actually, if you read Matthew, he spends ALL of chapter 1 laying out how Jeebus was in the lineage of Joseph, (the Davidic line), then at the end, does his Maury thing.."Jospeh was NOT the father. Woops. Great story. This is a good topic to talk about. Does Jesus support cheating? No. Jesus would say "why do you tempt me?" if you asked Him this question. This article is a blaspheme against anything Holy. How is counting cards cheating? Do you not look at the weather report to determine if an umbrella is needed, this must be cheating also. You are just gathering information that is available that the casino does not want you to know as it goes against their favor. You are just gathering facts right in front of you. Of course it is immoral to cheat. But it isn't clear that these people were cheating. To me, they were just playing the game better than other people. If I play bridge, or Scrabble, or chess - and I've spent a lot of time analyzing the winning strategies for those games and I happen to have a good mind for playing them better than my opponents - is that cheating? There is nothing inherently wrong in counting cards. Nothing. Wow. Just wow. Your position is that counting is blasphemy against the holy casino? Jesus recognized illegitimacy when He saw it. the business the Holy Father gave Him was to protect the church from illegitimate "players" who turned God's church into a game. Try turning driving into a game, see what happens. Drive on red. Blow stop signs. See what happens. Yeh, no players in the Roman church. Are you now equating a casino with the temple?? Have counters corrupted the holy casino? There wan no "church" in Jeebus' day. Nice story. News Flash. Jesus remains dead for past 2000 years.